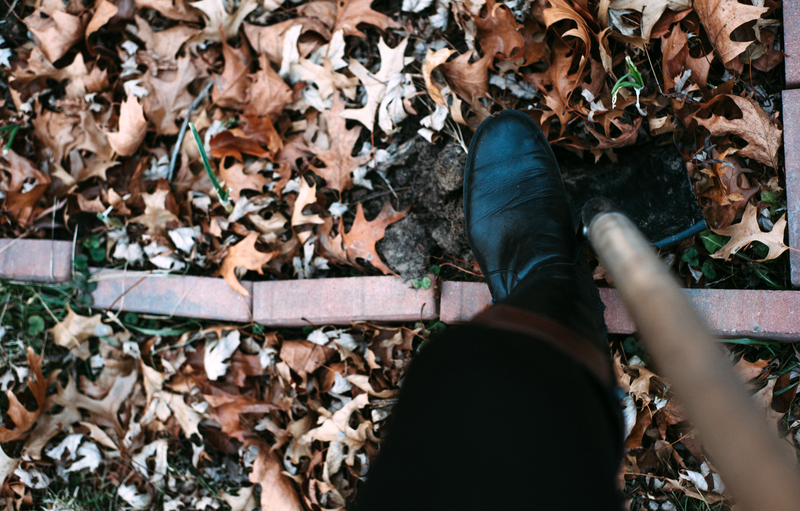 I’m not sure what happened to me this fall, but I got overwhelmed, more than usual. I didn’t even dig my potatoes or my carrots before it froze. I kept telling myself I’d get out there and do it, but I got busy. Life happened, and I kept putting it off. Then snow fell. It got cold. It would warm up for a day or two and I’d think, “Here’s my chance! 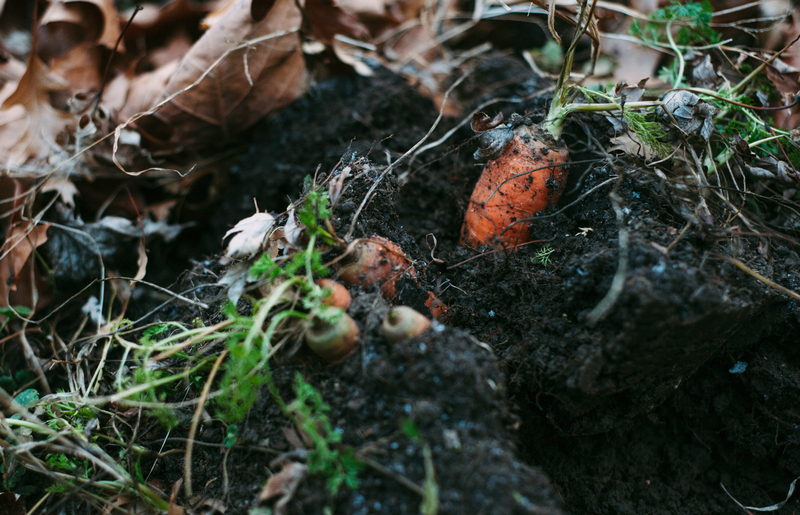 I need to go dig them!” But then the holidays came, and my carrots were still in the ground. It seems like the older I get, the easier it gets to put things off. I’m not sure what causes this phenomenon. Perhaps it is a heightened self-awareness; maybe I always put things off, it is just now that I’m finally starting to notice. So I put on my parka and boots and went out to face the 30 degree weather and semi-frozen earth. And I dug my carrots. I have to admit, i didn’t feel particularly motivated to do this in part because I saw my parents’ northwest-Iowa, full-sun soaked garden in September and almost cried when I saw the size of their carrots. Huge. My backyard gets partial sun at best. I have three mature maples, and I get dappled sunlight against the north edge of the backyard where my garden sits. Hey, you have to work with what you’ve got. Last year, my carrots were very small and I only got a handful. I brushed the leaves back from the garden square (thankfully I hadn’t cleaned them off, so they were insulating my poor abandoned carrots) and started digging. I was surprised to find a few really nice ones, and lots of smaller ones. 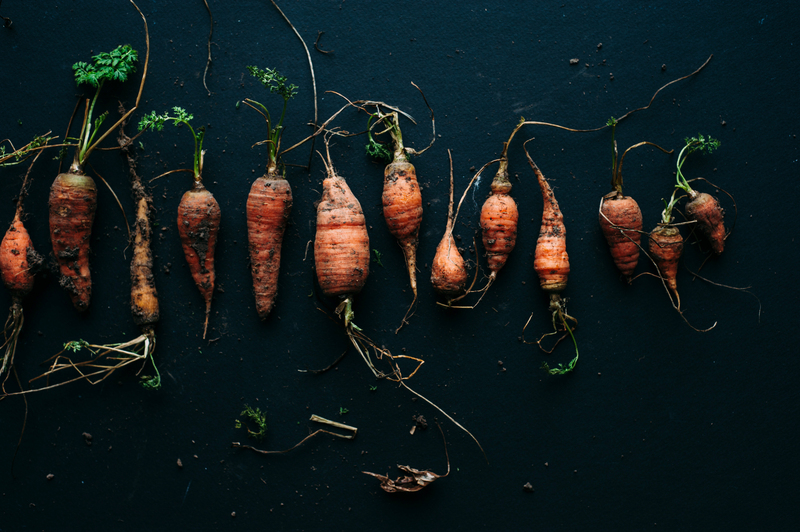 If you’ve ever gardened you know the flavor of store-bought carrots just can’t compare to the ones you pull out of your garden. 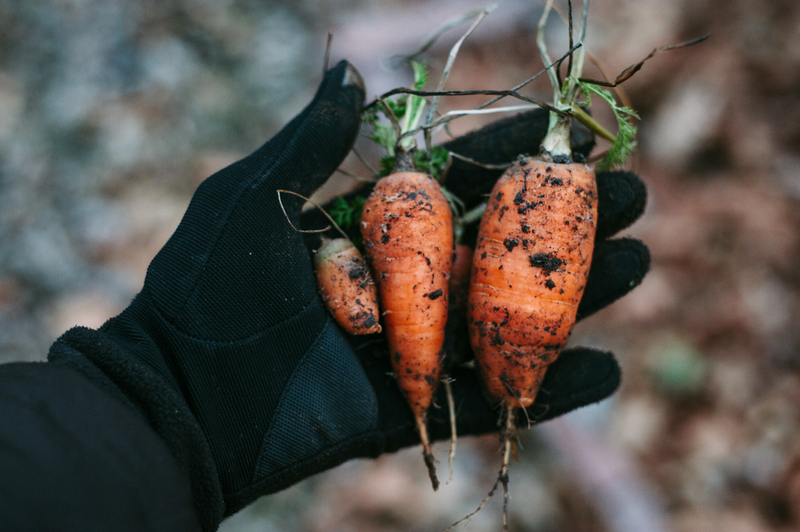 I’m so glad I still got to enjoy my carrots despite the fact that I didn’t get out there until January to dig them. I’d say my lesson has been learned, but I can’t promise that, since I still got to enjoy them. I ate most of these carrots raw, but I ended up chopping up and roasting some of them, which is probably my favorite way to enjoy carrots. These are one of my all-time favorite sides. They are as addictive as fries to me; I just can’t stop eating them! 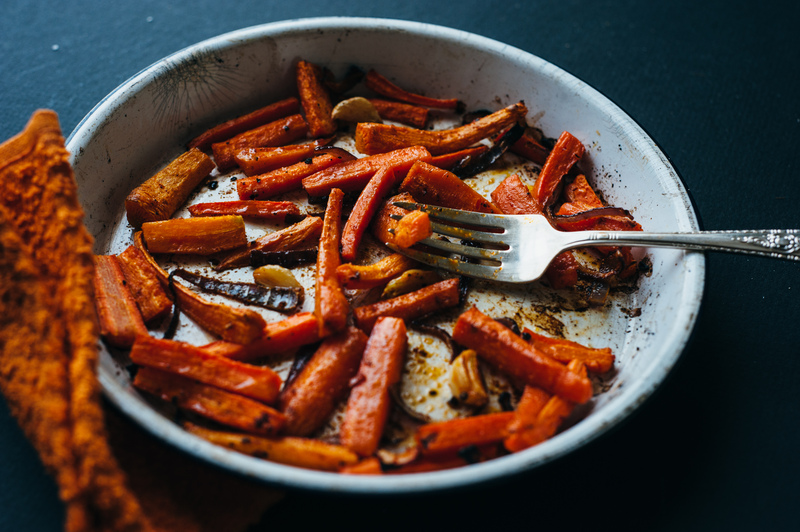 Carrots get sweeter as they caramelize, and that pairs with the smoked paprika and salt so well. 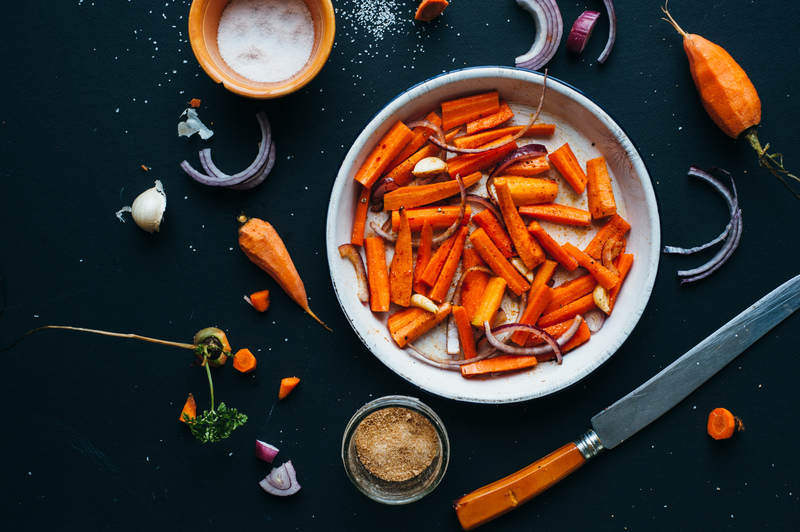 Toss carrots, red onion, and garlic in olive oil, salts, and spices. 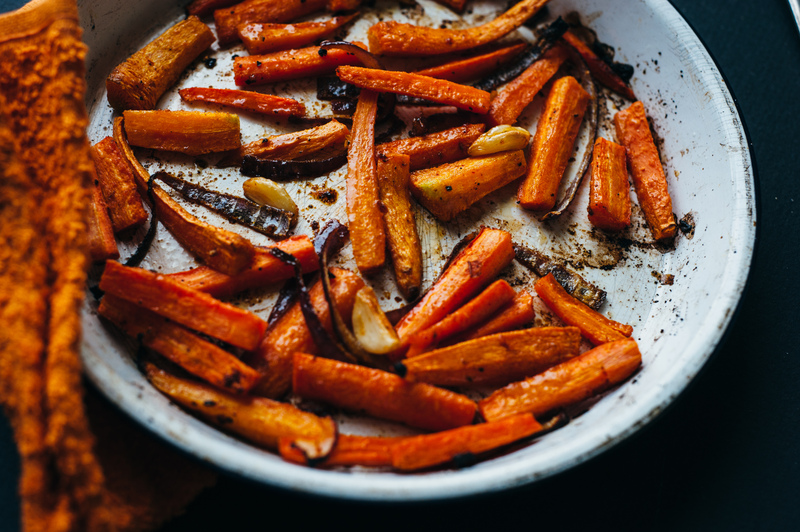 Bake on a cookie sheet covered with parchment or greased with extra olive oil at 425 degrees until carrots are carmelized and brown on the outside and soft on the inside. The more shriveled and brown, the better I like them, but how long you cook them is up to you!